27th August, 2010 was a memorable day for me as me and my colleague who also happens to be my wife had a tour of Microsoft Research Asia in Beijing, China. Mr. Yunbo Cao who works there hosted the two of us. He was an extremely humble guy and his humility and kindness was evident through the session. First we were shown around the research labs and work area; he showed us how for every employee at Microsoft Research instead of having name plates outside each employee's office they have written name of city to which that employee belongs. 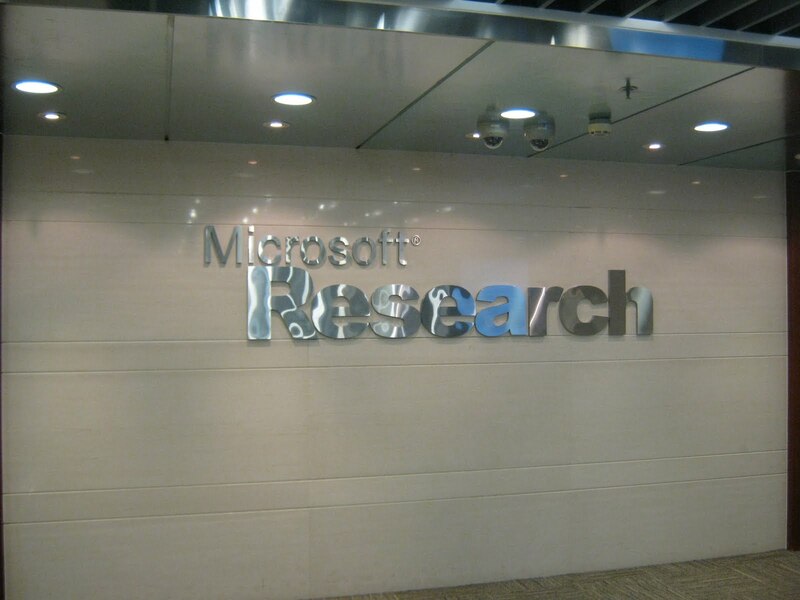 Microsoft Research Asia is Microsoft’s fundamental research arm in the Asia Pacific region and it was founded on November 5, 1998. In 2004, MIT Technology Review named Microsoft Research Asia “the hottest computer lab in the world.” From Microsoft Research Asia have emerged many technologies that have had a huge impact on the technological community today. Over 200 innovations from the lab have been transferred to Microsoft products, including Office XP, Office System 2003, Windows XP, Windows Server 2003, Windows XP Media Center Edition, Windows XP Tablet PC Edition, Xbox, MSN, Windows Live. In addition, technologies from the lab have been adopted by international standards bodies such as MPEG4 (error-resilient video transmission), IETF (TCP/IP header compression), and ITU/ISO (video-compression technology). Web Search and Mining: the goal of this group is is to drive the next generation of Web search by leveraging data mining, machine learning, and knowledge discovery techniques for information analysis, organization, retrieval, and visualization. Its core areas focus on structuralizing the Web, vertical search, large-scale experimental web search platform, mobile search and multimedia search. Information Retrieval and Mining: the goal of this group is to develop advanced technologies to help users accurately, quickly, and easily find information. Currently, the group is working on three projects: algorithms for improving web search, enterprise search, and community search. The following research areas are being intensively investigated: search relevance and learning to rank, link analysis and web graph mining, anti-spam and adversarial information retrieval, document information extraction, and search log data mining. Web Intelligence: the aim of this group is to enable synergetic collaboration between people and between people and computers to enlighten them and enrich their lives. For this mission researchers of this group develop scalable automatic content analysis methods and quality metrics to analyze a huge amount of online text such as blogs, community-based question answering, forum discussions, news, reviews, Twitter, Wikipedia, etc. and to harvest explicit and implicit knowledge from these media. Mr. Yunbo himself is part of Web Intelligence group and prior to this he was a part of the Natural Language Computing group. The areas of focus of his group are expert and social search, user intent/activity recognition and prediction, inarticulate user assistance, information access evaluation, social question answering and summarization and sentiment analysis. His research work heavily centers around community-based question answering services. He told us that the third and fourth floor of Microsoft Reseach Asia is called the Microsoft Search Technology Center and the main focus of all research there is the newly released search engine by Microsoft Bing - this year's SIGIR had 15 papers by Microsoft Research and one can see that researchers at Microsoft are pushing hard day and night to make Bing better and better. 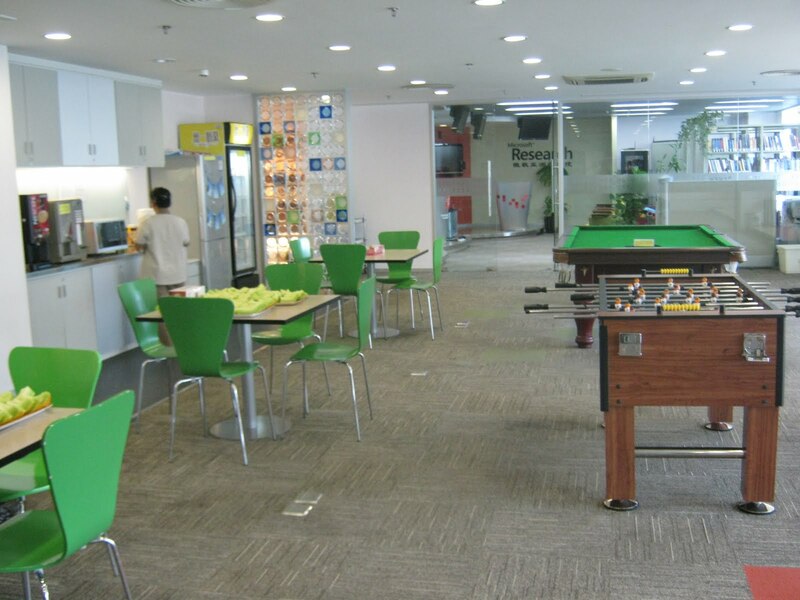 We could not take photographs of the labs as it was not allowed but it was allowed for some places and the picture below shows the Microsoft Research Asia recreation area where the employees enjoy some time off from work, when we reached it was fruit time. Mr. Yunbo offered us some but we could not take any as we were fasting. The discussion then moved towards our research focus at Database and Mutlimedia lab of KAIST. We told him about a state-of-the-art project by our Professor which relates closely to search engines - the paper got best demonstration award in ICDE 2005. I further explained him how my Professor considers it as an offense to the traditional databases if researchers worldwide believe that MapReduce based systems are the answer for massively scaled information retrieval tasks. The research idea is to incorporate an information retrieval architecture into existing parallel databases to provide best of both worlds: the scalability of Map-Reduce based systems and the additional functionalities of databases (SQL, schemas etc.). These ideas were appreciated by the Microsoft researcher. I told him about my thesis problem statement on improving quality of web search results by combating spam and my wife told her about her work on scalable, massive architectures for parallel web crawling; he was surprised at hearing that we were the only ones in our lab working on these huge project modules and said that at Microsoft they are working in groups for even at module level (for Bing project). 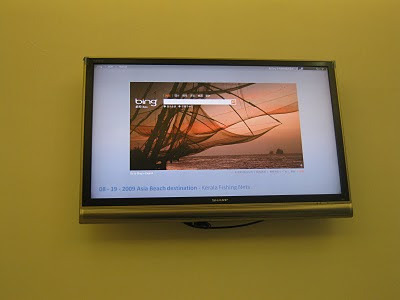 We exchanged some information regarding system's nature from being static search to dynamic search. Then we raised the point for final part of our talk centering around academic collaborations between Pakistani universities and Microsoft Research Asia and future plans of Microsoft Research Asia towards Pakistan. 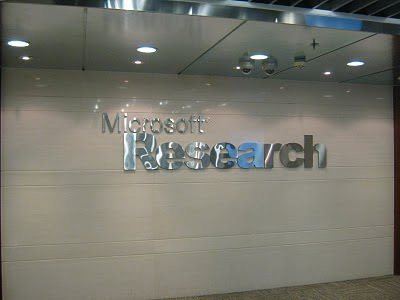 Mr. Yunbo said that Microsoft Research Asia has many, many collaborations with universities through out Asia and that Microsoft Research has two research centers in Asia, i.e., in China and India but China heads Asia in whole as its Microsoft Research Asia. He added that Microsoft Research Asia is always looking for more and more engineers. I asked about the reason behind presence of academic/research collaborations in universities through out Asia but an absence in Pakistan; to this question Mr. Yunbo replied that Microsoft has some collaborations with Pakistani universities but he agreed that those were only technology-oriented collaborations and none exist on applied research and academic level. Additionally he pointed out that Microsoft Research Asia would love to have academic/research collaborations with Pakistani universities and till now there is no serious thought due to lack of an appropriate channel through which to initiate such collaborations. He added that student-researchers like us can serve as the bridge between Pakistani universities and Microsoft Research Asia; and he suggested us to contact Microsoft Research University Relations Team. Mr. Yunbo believes that both Pakistani universities and Microsoft Research can greatly benefit from such academic collaborations and it can lead to a whole new opening for researchers in Asia, as intelligence can never be confined inside some regions only. On our way in a passage, he showed us souvenirs that were given to Microsoft Research Asia by different universities of Asia but Chinese presence was much dominant in those proving how open Microsoft Research Asia is in visiting different universities. Readers are advised to drop in their comments, questions, suggestions as we intend to carry these plans forward for promoting and improving Computer Science research in Pakistan. Congratulations to you on being honored for the research & being given a chance to present it! Hardwork always lead to success ! I wish you both a great success in your life! And keep continuing the Hard Work! and Make the Name of PAKISTAN roshan !! very delicious, its very nice to hear that how beautifully you presented your thoughts in front of MS researcher. Needs such sort of research centers collaboration with Pakistan. Excellent! Keep it up, May Allah's blessings be upon you in this world and life here after. its pleasure to read such stuff. Great! That would be great if they start some University collaboration may be LUMS/NUST are good... we can start with them at least. JazakAllah for appreciation, May we all contribute what is entrusted on us. JazakAllah for kind words, I hope one day we will be in position, to whom people will ask for collaborations inshaAllah. Sure, it depends upon institution's will and seriousness too. Lets hope and work for better tomorrow together. I was previously powered by Windows :), but serious research and comfortability forced me here (I don't want viruses). Microsoft has given many good things but I don't feel relaxed with price, freedom, security and choice. Have you started coding on dot net ;) bro? Asalamoalikum, Great achievement indeed from you and your wife!!! And what I think the reason behind absence of academic collaborations with Pakistani universities are our country current scenario's and lack of funds by Govt. at research and educational level. I was just thinking about it yesterday that Microsoft and Pakistan Universities should have some collaboration so that our students who are energetic and passionate about research can work on large scale. And it has been found that students from Pakistan have good abilities,education, experience but still they can not prove themselves in-front of big companies. I think you have done a great job and i pray that you got success in achieving this goal. JazakAllah o Khair brothers and sisters.